Bitcoin has found some footing following a up and down week. Consolidation has occurred during the last day and a half between the $633 and $645 levels. $633 represented a slight resistance level during the run to $780 and is now acting as a strong support level, holding firm both times it was tested. Bitcoin has shown resilience of late but has few indicators of a continuance of the latest run. The 200MA has been tested at the low on two separate occasions and positive news like Brexit sparked a rally but did not materialize in sustained buying strength. This is not to say that the climb cannot resume, especially if stock markets around the world shrug off today’s rally, but a slow fall back to the $560 resistance level is more likely. $655-$660 appears to the be key level of resistance if bitcoin is to resume the strong bullish run it has been on in 2016. Should it trade above that level for any amount of time there is little to no resistance all the way up to $680. It is at the $680 level that traders can expect to face strong resistance just as they did in 2014. RSI continues to be a strong indicator for short term traders with 30 and 70 being the key levels to look at. When RSI approaches or broaches the 70 level there is an almost immediate sell off, with the inverse being true when RSI dips near or below the 30 level. 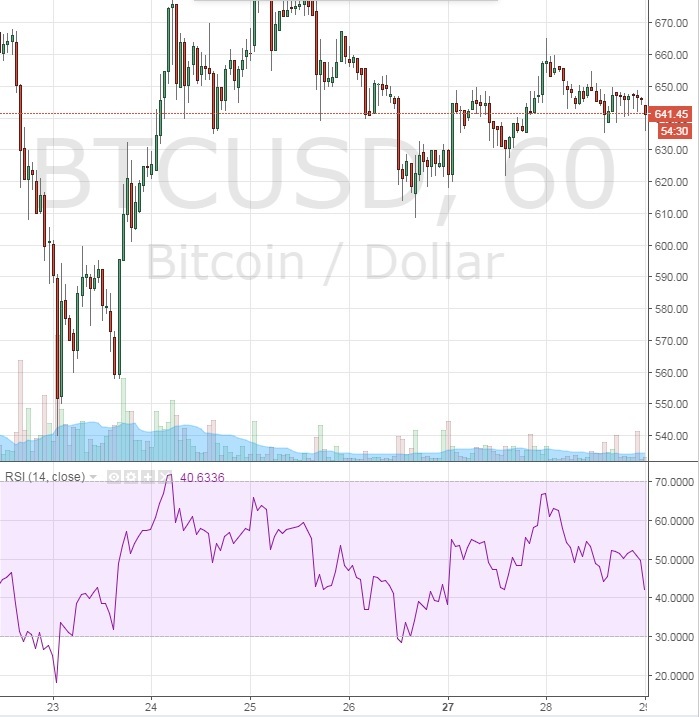 Day traders can simply watch the RSI level and take advantage of this easy indicator. Looking at the hourly TradingView chart below, we can clearly see the RSI pattern. Traders should note that buying below 30 does not indicate holding until RSI approaches or breaches 70. Sell levels after buying under 30 should consider other knowledge such as resistance levels and any relevant news, but generally profit should be taken quickly. Traders engaging in short term day or swing trades can still look to make tidy profits on swift reversals both at the top and bottom. RSI is a simple indicator and the confirmed pattern should be taken advantage of while it lasts. Quick stop-losses and profit taking should be implemented to prevent being caught when the pattern inevitably dissipates.